Luke 2:51 He went down with them and came to Nazareth, an was obedient to them; and his mother kept all these things in her heart. Luke 2:35 yea and a sword shall pierce through thine own soul; that thoughts out of many hearts may be revealed. 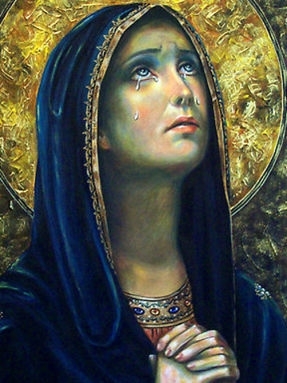 Even the Mother of Jesus suffered the pains of motherhood. Being filled with the Holy Spirit the fruits of the Holy Spirit was her only consolation. He went down with them and came to Nazareth, and was obedient to them; and his mother kept all these things in her heart. Mothers are the backbone of society. Our society puts little importance to motherhood. The media says career, education, success is more important than motherhood. So many mothers are expected to raise children while, working, cooking, cleaning, gardening, shopping, keeping fit, shopping, getting groceries, teaching, nursing, listening, religious instructor, keeping up with latest current events, looking great, plus being a good wife, and any other services needed. The most challenging is to raise children when seriously ill. In good health or when sick it is difficult to keep up with the job. When a mother is abandoned by her husband, her cross is doubled. The media encourages spouses to leave if they are not happy. They are not told how much work they are taking on and how it hurts the children. Mothering is not a job for one person. Happiness can change especially if theirs a spouse change. Motherhood is a thankless job if her family is ungrateful for her hard work. Such ungrateful behavior causes her heart deep wounds. When anything terrible happens to her child, she feels like a complete failure, even if it is not her fault. If that is not enough, someone will surely reassure her of her failings. A mother who has lost a child, cannot be consoled. There is a peace missing and nothing can replace it. She mourns her whole life. Mothers whose children have been in jail, done drugs, committed suicide, done any unspeakable actions are in great pain. No one can comfort them. Remember, son, how she went through many dangers for you while you were in her womb. When she dies, bury her in the same grave with me. “Through all your days, son, keep the Lord in mind, and do not seek to sin or to transgress the commandments. Perform righteous deeds all the days of your life, and do not tread the paths of wickedness. We have all hurt our mothers. We have not called her, ignored her, were constantly ashamed of her and made her cry. In our arrogance, when we got older, we made fun of her and mocked her opinions. It is time we begin to honor our mothers as the scripture says. “Honor your father and your mother, as the Lord your God has commanded you, so that you may live long and that it may go well with you in the land the Lord your God is giving you. If someone curses their father or mother, their lamp will be snuffed out in pitch darkness. “Honor your father and mother. Then you will live a long, full life in the land the LORD your God is giving you. So the next time you see the media talking to someone 100 years old asking them what did you do to live this long you will know the answer ” I honored my father and mother.